How can the use of a computer mouse lead to Carpal Tunnel Syndrome? How can you alleviate the hand pain and prevent Carpal Tunnel Syndrome? Carpal Tunnel Syndrome is a progressive and painful condition caused by the compression of a key nerve in the wrist. It occurs when the median nerve, which runs from the forearm into the hand, becomes pressed or squeezed at the wrist. Symptoms usually start gradually, with irritation and tingling, weakness, pain, or numbness in the hand and wrist, radiating up the arm. As symptoms worsen, people might feel the tingling throughout the day, as well as decreased grip strength making it difficult to form a fist, grasp small objects, or perform other essential or simple tasks. Carpal Tunnel Syndrome is a progressive and painful condition caused by the compression of a key nerve in the wrist. It occurs when the median nerve, which runs from the forearm into the hand, becomes pressed or squeezed at the wrist. Symptoms usually start gradually, with irritation and tingling, weakness, pain, or numbness in the hand and wrist, radiating up the arm. As symptoms worsen, people might feel the tingling throughout the day, as well as decreased grip strength making it difficult to form a fist, grasp or perform other essential or simple tasks. Excessive pronation of the forearm while using conventional mice is almost unavoidable. The user's hand is held in a horizontal palm-down position with the wrist lying on a flat surface. However, if a seated person lays their hand on a desk in a natural and relaxed position, the hand would be in an upright position. Most conventional mice force the hand, wrist, and forearm to be twisted at an approximate 90 degrees away from the natural and relaxed position. This requires constant strain applied to the hand, wrist, and forearm in order to maintain the position. The unavoidable twisting is a strain on the related muscles, tendons, and nerves. All conventional mice and most ergonomic mice require constant finger clicking that results in continual strain on the related muscles and tendons. This repetitive strain on the hand and fingers eventually leads to inflammation and swelling of the flexor tendons. 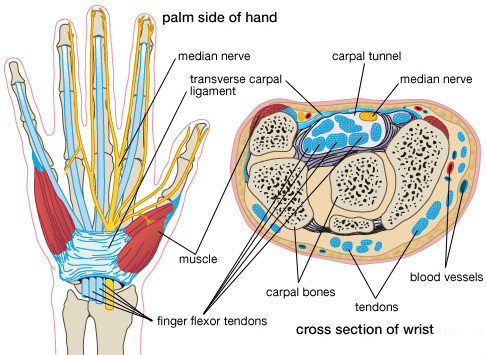 Carpal Tunnel Syndrome occurs when swollen flexor tendons compress the median nerve, which runs from the arm to the hand through a space in the wrist called the carpal tunnel found under the transverse carpal ligament. Users have to keep gripping most conventional mice to move and control the cursor, long time stress from gripping leads to strain on hand. For all conventional mice, user's hand keeps palm down position. The downside of wrist has to bear the weight of hand and contact the desk surface all the time during usage. 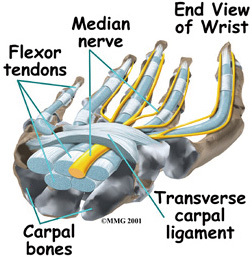 The pressure on the wrist will press the transverse carpal ligament and reduce the space for medium nerve. For all conventional mice, some fingers of user's hand especially fingers excuting left clicking and right clicking have to prepare to click all the time before next clicking. So these fingers can't get relaxed all the time. Most of us don’t take frequent or sufficient breaks when using a computer for an extended period of time. Especially when using a conventional mouse, the hand tends to stay in an unnatural position the entire time, even when not operating the mouse. (1) 1oz of force at finger tip produces 10 oz on the finger / palm joint, each click is over 2 oz, and over 20 oz on the finger / palm joint, for 2,000 clicks each day, the force is over 1.13 tons for the finger. We are capable of remarkable things, but not indefinitely, especially our weak fingers. Over extended periods of time, the continual strain caused by repetitive finger clicking eventually leads to inflammation and swelling of the flexor tendon. CTS can develop when swollen flexor tendons compress the median nerve, which runs from the arm to the hand through a space in the wrist called the carpal tunnel found under the transverse carpal ligament. (3) “What makes using a computer mouse hazardous? There are two reasons why using a mouse regularly can be hazardous. (4) "Mouse and keyboard use can cause finger pain. One common cause of finger pain is called trigger finger. Trigger finger is a swelling of the tendon or tendon sheath in the palm of the hand of the tendons that bend the fingers. This swelling prevents the tendon from gliding smoothly through the sheath and the "pulley" (ligament) which holds the tendon to the bone. Trigger finger occurs most frequently in the middle finger and the ring finger, but it can occur in any finger or the thumb." * Sustained gripping (e.g. 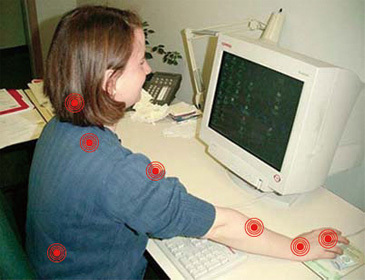 - squeezing the mouse forcefully or holding a pen in a "death grip") "
Mouse and keyboard use can cause finger pain. One common cause of finger pain is called trigger finger. Trigger finger is a swelling of the tendon or tendon sheath in the palm of the hand of the tendons that bend the fingers. This swelling prevents the tendon from gliding smoothly through the sheath and the "pulley" (ligament) which holds the tendon to the bone. Trigger finger occurs most frequently in the middle finger and the ring finger, but it can occur in any finger or the thumb. * A locking, snapping, popping or catching sensation in the finger while making a fist. * This "triggering" of the finger can be quite painful at times. * The finger may "lock" into a bent position. * There will most likely be pain or tenderness in the palm of the hand over the site of the pulley which holds the tendon close to the bone. * There may be joint stiffness and pain in the affected finger. In the past, a disability common to typists was known as ‘Repetitive Strain Injury’ (RSI) and was characterized by stiffness in the hands and fingers. This was due to the repeated pressing down of the fingers and incorrect positioning of hands at typewriters or computers.?? "Constant clicking with the computer mouse and an unnatural hand position cause damage to the tissues that over the long term can lead to inflammation of the nerve fibres," says Bergmann， head of the German Association of Nerve Doctors (BVDN). Even initially minor symptoms represent a danger that the brain may form connections between the pain and the activity of clicking. "The mouse click movement on its own can then trigger pain, even if the physical damage in the arm has already healed," Bergmann points out. Surprisingly, what may initially present as only minor symptoms can develop into a chronic problem long after the physical damage has healed. This occurs when the brain makes a connection between the motion of finger clicking and pain. The following sources are compiled from the NIOSH. The U.S. Department of Labor has concluded that CTS was the ‘chief occupational hazard of the 90's’, disabling workers in epidemic proportions. Currently, more than 8 million people are affected by CTS each year. Surgery for CTS is the second most common type of musculoskeletal surgery, (back surgery is No.1) with well over 230,000 procedures performed annually. In the United States, employers spend more than $7.4 billion in workers compensation costs, and untold billions on medical treatment, litigation costs, hidden costs and lost productivity (U.S. Bureau of Labor and Statistics). CTS is the No.1 reported medical problem, accounting for approximately 50%of all work-related injuries. Only 23% of all CTS patients returned to their previous professions following surgery (Bureau of Labor & Statistics and the National Institute for Occupational Safety & Health [1997-2000 Statistics%). Every year more than 850,000 new visits are made to physicians due to the onset of CTS (National Center for Health Statistics). First things first - find an alternative mouse that does not require excessive pronation of the forearm, excessive finger clickingk, long time gripping, and finger hovering. Also the alternative mouse doesn't causes pressure between wrist and desk surface. Also it will be much better if the alternative mouse is ambidextrous which allows your both hands share work loads. And lastly - give your hand a 2-5 minute break for every 30-45 minutes of mouse activity and 2-3 times of hand stretches daily as the following video really helps. The health of your hand is well worth it !! !